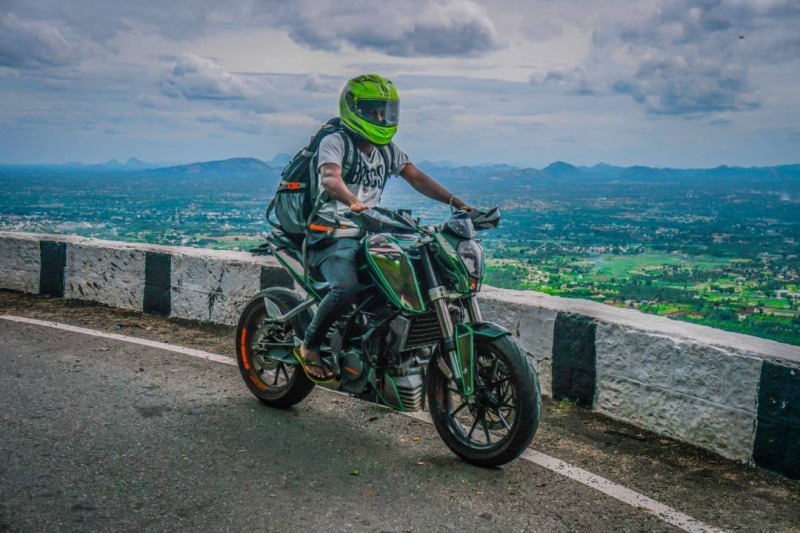 KTM 200 Duke is an ultimate performance machine for the Indian market. It is very light in comparison to other bikes in its class and this helps it sprint like a rocket within city limits. 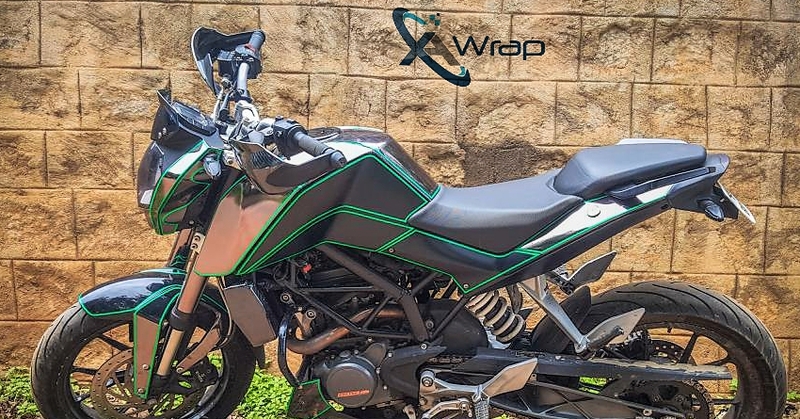 This typical KTM 200 Duke by ‘A-Wraps’ looks exclusive with its Black Chrome shade, further highlighting the lean muscle through Green tron lines all over its body. 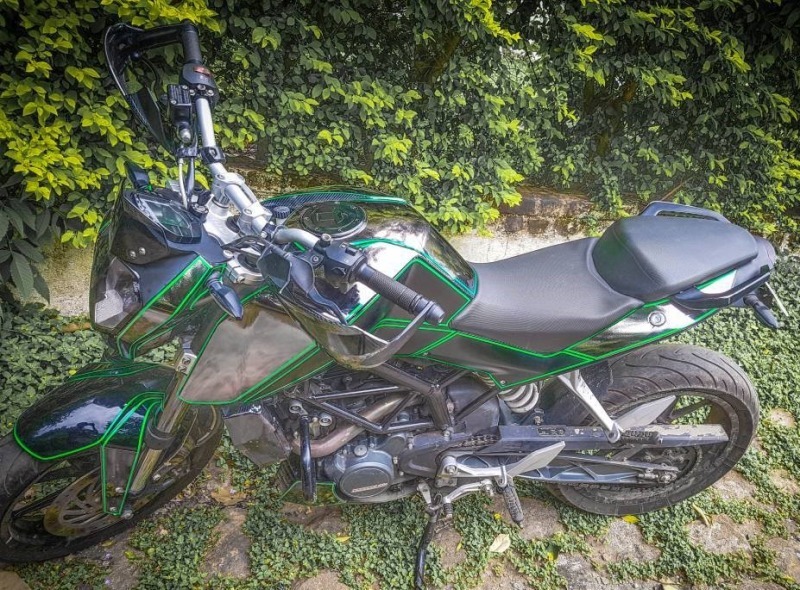 Highly reflective in nature, this Duke 200 can turn heads from quite a distance. ‘A-Wraps’ have used faux carbon fiber inserts at selective places while no changes were made to the body line. 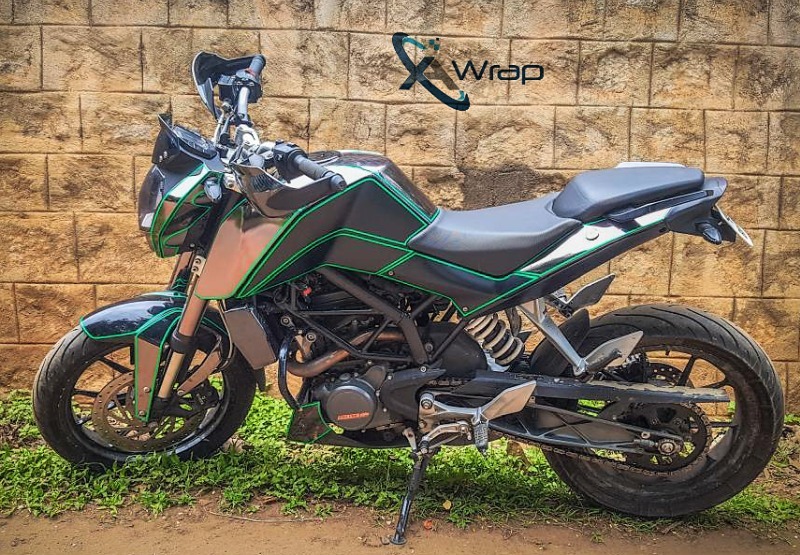 The green lines running all over looks excellent while mirror finish on this shade resembles none other in the Indian motorcycle segment. Knuckle guards were installed on the Duke for protection of rider’s hands. 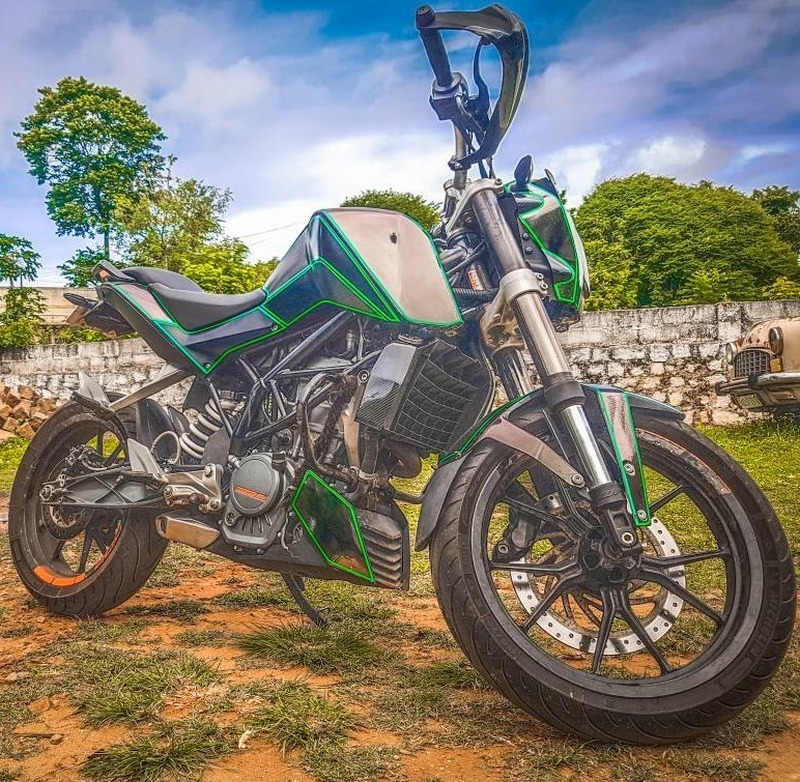 The standard equipment on the motorcycle includes front and rear disc brake, USD WP front suspension and wide class leading tyres. KTM Duke 200 is powered by a 199.5cc, single cylinder engine producing 25 HP at 10,000 rpm and 19.2 Nm at 8,000 rpm. The engine comes mated to a 6-speed gearbox and claims a top speed of around 138 kmph. The bike now weighs 148 kg for the new variant, most probably adding the weight of accessories and the new BS4 engine into it. Duke 200 comes with the best instrument console in its segment, showing high levels of information to the rider. 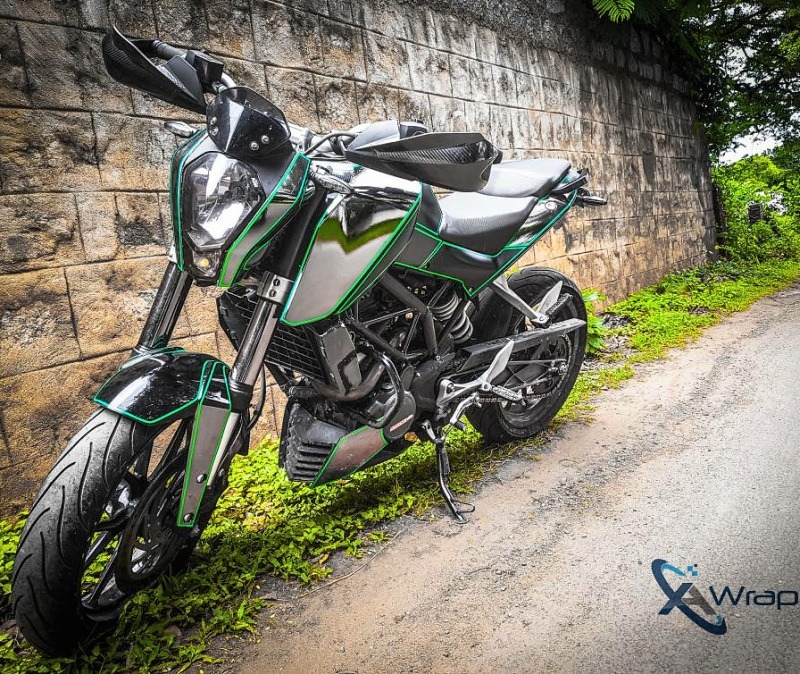 The bike currently costs INR 1,49,261 (ex-showroom Delhi) and is equipped with Orange alloy wheels. Looks worse. Not clean looking and very over-used of the green in some parts. Although its unique looking, i dont think this is worth an article. I’ve seen far better designs here.